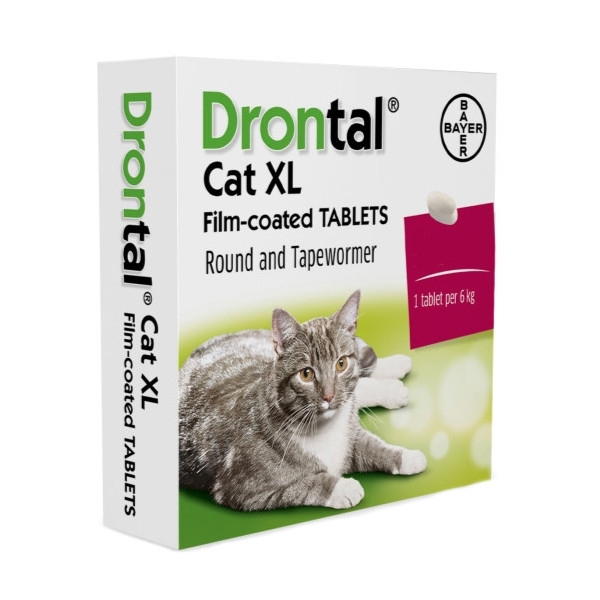 Drontal Cat XL Film-coated Tablets are unscored coated white to yellowish, ellipsoid, biconvex tablets, each containing 345 mg pyrantel embonate and 30 mg praziquantel with 2.6 mg Titanium Dioxide (E171). The recommended dose rates are 57.5 mg/kg pyrantel embonate and 5 mg/kg praziquantel. This is equivalent to one Drontal Cat XL Film-coated Tablet per 6 kg body weight. For single oral administration. The tablets should be given directly to the animal, but if necessary can be disguised in food. Until sufficient studies have been performed with this combination, do not use during pregnancy. In the interests of good hygiene, persons administering the tablets directly to a cat, or by adding them to the cat’s food, should wash their hands afterwards. Drontal Cat XL Film-coated Tablets: Shelf-life of the veterinary medicinal product as packaged for sale: 4 years.